When I was a kid, the mums would gather all the kids & hold Chicken Pox Parties, so we would all catch it at the same time….. less hassle I guess! But thinking you can’t get it again is a myth! Fact of the mater is, you CAN get chicken pox more than once, but it ain’t all bad! If your little one does come down with the dreaded Chicken Pox there are many things you can do to calm them & soothe those itchy spots & hopefully prevent them from scarring! And So It Begins At the beginning of half term, my 6 year old daughter was all set for Spring Break fun, our first day of the holidays, we headed to the beach &amp; I noticed a tiny blister/spot on her neck. Remembering how my sons began (he was just 3 at the time) I instantly thought it was Chicken Pox, inspecting her back & chest, I found nothing more. The following day more appeared & she began flu like symptoms, complaining her head & body were aching…. after a trip to the pharmacy, it was confirmed! My little minx had Chicken Pox 🙁 Any plans we had for the half term were well & truly ruined….. HOW was I going to entertain my contagious, hyperactive 6 year old at home for 5-7 days while the sun shone so beautifully in Dubai? Firstly you’ll want to keep their minds off being ill & possibly itchy! You don’t want them zoned out watching TV the whole time, so give them something to keep them occupied. Activity magazines are good at keeping boredom at bay, in the UK these are reasonably priced, but are expensive in Dubai, you can expect to pay around £8 for a mag that would normally cost maximum £3.99 in England! So if you can’t find an activity magazine, I suggest a bumper puzzle book! It might be a bit more price wise, but I think very worth it! Helping to keep their minds off itching is hard work, but imperative if you don’t want them to scar, or worse still, get infected! Trick is to keep them busy, playing board games or puzzles really help. Itchy skin is the worst part of Chicken Pox! You also need to be careful because they can scar easily. Soothing the itch is the main priority & there are many potions & lotions to try, but natural is obviously best. Calamine lotion is widely used but it can be very drying for the skin & only initiates more itching. 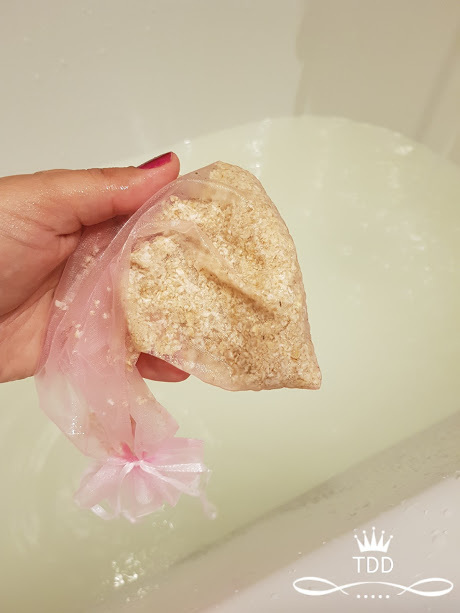 I found an oat bath works wonders! Not just for Chicken Pox, if you have Eczema, Dermatitis or Psoriasis it also helps. 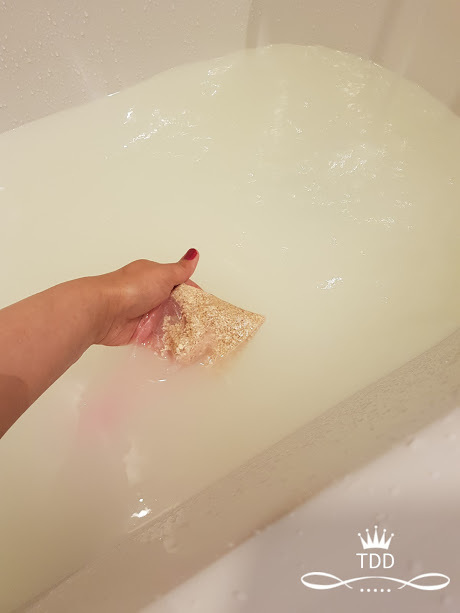 All you need is some natural Porridge Oats & Bicarbonate Of Soda a cheesecloth or muslin square, even a sock will work! 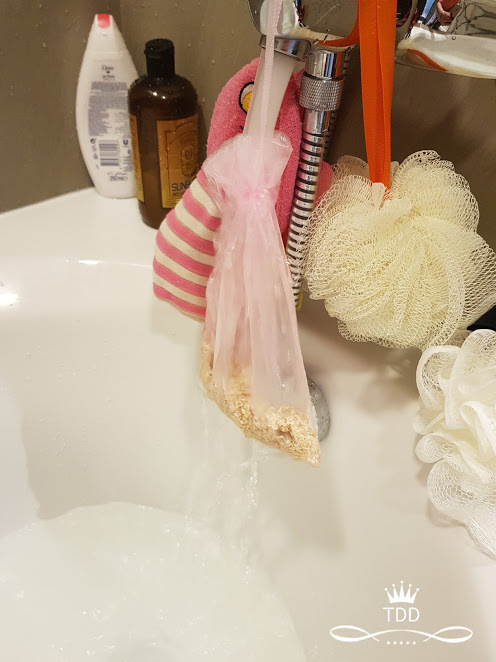 I used muslin bag as I found it easier to hang & submerge into the bath water. 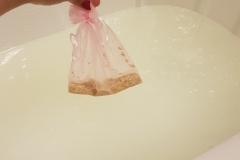 You’ll find the longer it’s in the water the more “milk” it produces. The most soothing part is actually rubbing it on the skin, it’s almost slimy to the touch! As the Chicken Pox vaccine isn’t mandatory in the UK I did not get my daughter vaccinated & seeing the ingredients, I’m glad I didn’t & she can be immune naturally! Varivax contains gelatine derived from pigs. See more information on gelatine in vaccines. There is no gelatine in Varilrix. Varilrix may contain traces of human serum albumin, a very common protein found in human blood, used as a stabiliser. So you can see why I chose the natural way! There you have my survival guide for Chicken Pox & other ailments! I hope this has given you some ideas on keeping the poorly ones entertained & helped you decide on which skin care you would prefer to use, While I prefer going the natural route, shop bought treatments might work best for you! Do you remember having Chicken Pox as a kid? What would you use on dry skin? 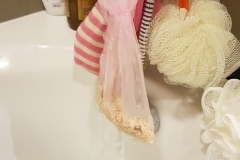 Would use use shop bought products or natural home remedies if you had Chicken Pox or Eczema? Let me know in the comments below & don’t forget to share! Next Post 10 Ways To Get Fit – The Lazy Girl Way. I haven’t heard of a chicken pox party either! But it makes sense! And my fingers are crossed that when I have kids and they get the chicken pox that neither me or my (hypothetical) husband get them again at the same time, that sounds miserable! Great post! Love the games! Chicken pox was the worst! One of my sisters and I got it at the same time. 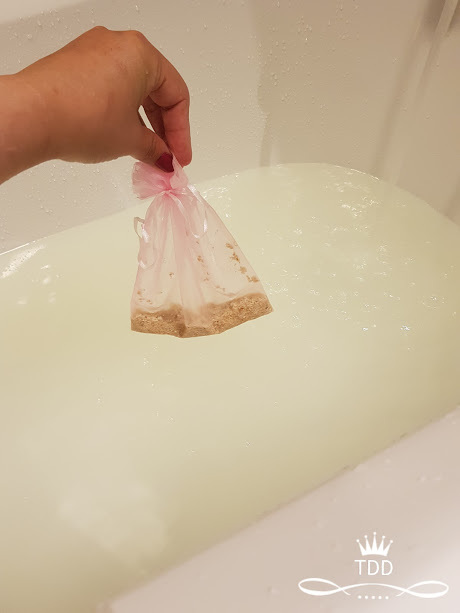 Oatmeal baths are the best. And so many other great ideas! oh my goodness! I have never heard of a chicken pox party before.. I couldn’t imagine doing that now! 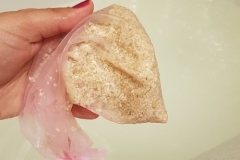 haha That soothing oatmeal bath looks amazing though!